Teacher/Staff Luncheon: Let's TACO 'Bout How Awesome Our Teachers and Staff Are! 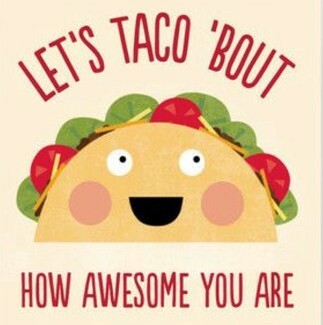 Let's TACO 'Bout How Awesome Our Teachers and Staff Are! It's Taco Tuesday on Tuesday, April 9th and we would love your help with donations to make this luncheon for our sweet teachers and staff a success! All items can be dropped off in room 501C before 9:00am on April 9th. Thank you so much for your continued support of our teachers and staff! I will bring a crockpot of queso dip.